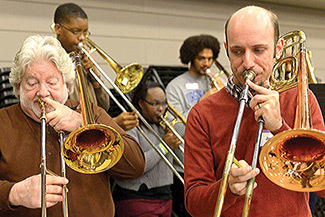 From left are Northern Neck Orchestra trombonists Phillip Jones and Joe Clemmons. Members of the Northern Neck Orchestra’s trombone section and friends will perform a diverse program of classical and jazz on April 14. Presented by the Northern Neck Orchestra (NNO), the concert by the ensemble of six trombones will begin at 2:30 p.m. at Good Luck Cellars, 1025 Goodluck Road, Kilmarnock. Tickets are $25 and may be purchased at northernneckorchestra.org or the door.